Ethanol was in the spotlight last weekend at Texas Motor Speedway in Fort Worth. American Ethanol and Texas Corn Producers partnered to promote the use of ethanol in racecars during the races Nov. 2-4 in Fort Worth, including the NASCAR event on Saturday. Other organizations, including Texas Farm Bureau (TFB), were on hand to interact and engage with fans about the fuel source. The relationship benefits agriculture and corn growers, Spurlock said. NASCAR has ran more than 11 million miles while using ethanol without any engine failures or fueling problems. The fuel used in NASCAR, E15, uses 15 percent ethanol and is anywhere from three to 10 cents less expensive than gasoline sold at most fuel pumps. Using ethanol as a fuel source is also good for the environment, Spurlock said. “As we burn ethanol, it is the cleanest and greenest fuel there is right now,” he said. 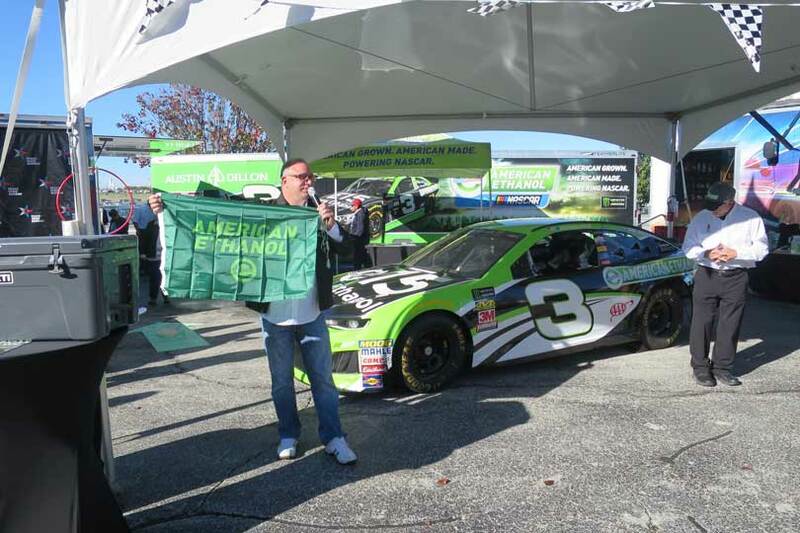 Being seen as environmentally friendly is important to NASCAR and its partners, Eric Warren, chief technology officer at Richard Childress Racing, said. The benefits of ethanol in motor sports transfers over to production cars, Warren said. Having a chance to interact and educate those who drive them is another benefit of the partnership. TFB was present with the Harvest Experience Trailer, which simulates corn harvest for visitors, and the Mobile Learning Barn to engage with NASCAR fans on the many uses of corn, Mia Balko, TFB director of Youth and Urban Outreach, said. Events like this offer TFB opportunities to connect with consumers. TFB was able to reach a diverse audience at the event, Jason Wonderly, vice president of Sales for Texas Motor Speedway, said. The event provided interaction for the fans, which creates engagement with its partners. Organizations like Texas Corn Producers and TFB take advantage of that opportunity, Balko said.